The Green LIONS Garden Group has had a busy three weeks getting our program up and running. The students were introduced to our worm bin full of red wiggler worms and the beautiful compost they’re producing. Our program uses the worm bin to not only re-purpose table scraps, but to make natural fertilizer for our garden in the form of worm castings and worm “tea”. This provides a sustainable way to nourish and protect our garden plants without the use of synthetic pesticides and herbicides. The worms also get to know many other students outside our group through the hosting of various teachers and classrooms. Currently our bin is being hosted by Ms. Manley’s third grade class which contains four of our program’s members. This provides a wonderful teaching and leadership opportunity for the students to teach their classmates about vermiculture and its importance in our food system. The students in Ms. Manley’s class are checking the worm bin regularly for moisture levels, decomposition activity, temperature levels and ph balance. We’ll keep everyone posted on where the worms travel to next. At our October 1st meeting we studied the classifications of edible plants and what steps and resources are involved in growing food, from selecting seeds to harvesting. We discussed what factors go into seed selection, especially climate and season, and this led us to learning the importance of choosing seasonal foods whenever possible for their nutritional and environmental benefit. The students divided up into teams and crafted vitamin and mineral labels for each fruit or vegetable we have growing in our garden. They also identified what each vitamin and mineral is good for in the human body. Cabbage was by far the winner in its long list of both vitamins and minerals! Visit the garden and take the vitamin and mineral tour. We hope all classes can enjoy this valuable learning experience. 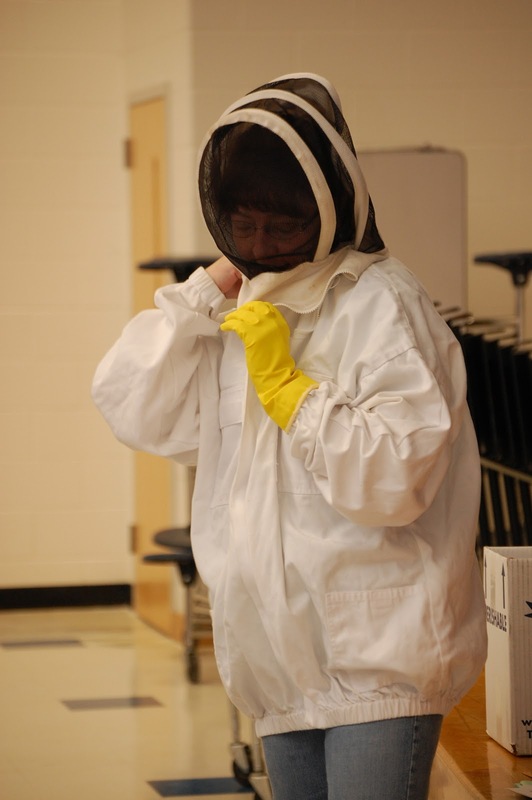 At our October 8th meeting we welcomed Donna Stickrod and Julie Tye from the Beekeepers Guild here in Hampton Roads for a very interesting and interactive presentation on beekeeping. The students learned why bees are so important in our food system, the timely issue of Colony Collapse Disorder, and what we can do as individuals to support the health of our bee colonies. 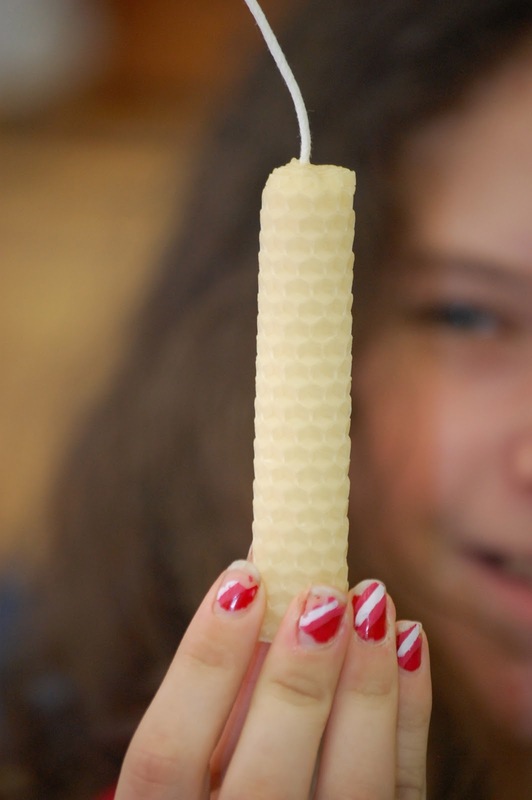 The students also rolled beeswax candles to take home as souvenirs and enjoyed honey-sweetened lemonade (see recipe below). With one out of every three items on a typical dinner plate coming from plants pollinated by bees it is essential for us to do what we can to keep bees doing their important work. While exact causes of Colony Collapse Disorder are not conclusive, the use of systemic pesticides and their cumulative damage is the main culprit. By supporting organic growing methods and providing safe habitats for bees with pollinating plants, we can make a large difference. Bees have to travel over 9600 miles to produce only one ounce of honey so we can express our high esteem and gratitude for these tireless workers and honor their place in our world. Honey, and especially local honey, has many health and even medicinal benefits. If you suffer from seasonal allergies, consuming local honey produced in the same season that affects you can provide great relief. The honey contains pollen and other allergens that the body naturally develops an acceptance for alleviating many of your allergy symptoms. Check our list of stores in our links section to find stores carrying local honey in our area. As a sweetener honey has much more nutritional value than processed sugar. Honey can replace sugar in many recipes but cut the amount in half. For example, if a recipe calls for 1/2 cup of sugar only use 1/4 cup of honey. Combine the honey and boiling water until the honey dissolves to make a simple syrup. Then add the lemon juice and water and chill before serving. Makes 1 quart. Enjoy! Green LION Garden Group families were also encouraged this month to take the $10 pledge with Buy Fresh Buy Local to pledge to spend at least $10 a month on local food. This tiny pledge amount, if taken on by multiple families in our community, would have a huge impact on our local economy. Take the pledge at http://virginiafoodsystemcouncil.org/10week-campaign-2/. Also, the students began their recycling program this month. They are collecting #5 plastics, not accepted in our city recycling, and we will be donating them to the Gimme 5 Preserve campaign at our soon-to-be-open neighborhood Whole Foods to be have a second life as toothbrushes, razors, storage containers and more. We are also collecting bottle caps to recycle with the Aveda store at MacArthur Mall in Norfolk.